Make a Splash Mural– 109 W. Chisholm St. Alpena, MI Beautifying the west wall of The Local Basket Case, LLC in downtown Alpena, this Aquascape mural represents the heart of Alpena’s history and the spirit of adventurers who live and travel here. This mural was constructed during the summer of 2016 during the “Make a Splash for Art” workshop and fundraising event. What sets apart this 30 ft. x 60 ft. mural from the rest are the 13 three dimensional fish designed by students and painted by the community during workshops with the artist, Tony Hendrick. The mural was completely removed during the 2018 summer season after it sustained serious damage during a wind storm in 2017. The panels were repainted by Tony, with re-installation taking place in 2018-2019. Thunder Bay Arts Gallery– 127 W. Chisholm St. Alpena, MI Home of the Thunder Bay Arts Council, “operating under the premise that the arts, and promotion of the arts, make a lasting difference in the community”, you will find incredible Michigan talent gracing the walls of this downtown art gallery. Artists are juried in to display in the gallery and their work is for sale. As a host for Art on the Bay, the Thunder Bay Arts Council offers various events and activities promoting the performing and fine arts throughout the year in Alpena. Stop by the Thunder Bay Arts Gallery and check out www.thunderbayarts.org to find an event during your stay. Art in the Loft– 109 N. Second Ave. Suite 300 Alpena, MI Variety is the spice of life at Art in the Loft Gallery 109, with artwork on display and available for purchase by local and regional artists all over Michigan. You will find paintings, drawings, sculptures, pottery, and jewelry crafted by talented local artists. Check out seasonal fine art and craft workshops for adults and children on their website, www.artintheloft.org. Corkscrews and Canvas is also a popular workshop where you can paint masterpieces while sipping on smooth merlot and gourmet appetizers. Besser Museum for Northeast Michigan– 491 Johnson St. Alpena, MI You won’t find a more extensive fine art collection anywhere else in Northeast Michigan. View rotating exhibits of famous pieces from artists such as Dali, Picasso, Warhol, and Renoir. Enjoy the Devonian and Dark Sky mural and many more fantastic works of art. To see which exhibits are currently on display during your Alpena visit, go to www.bessermuseum.org. 45 North Art Gallery – 121 N. Second Ave., Alpena, MI A local art gallery with emphasis on high quality art forms. Fused glass, paintings, jewelry, pottery and more. Domaci Art Gallery– 169 N. 3rd St. Rogers City, MI Admire fine and contemporary art created by local and regional artists from Michigan in this art studio located in the historic Schultz Bakery building in the heart of downtown Rogers City, just north of Alpena. Domaci Art Gallery is special to northern Michigan and specifically to the Presque Isle area as local artists use resources and materials unique to this region to bring you a truly one-of-a-kind piece to display in your office or home space. With art mediums ranging from pottery to paintings, to jewelry, stone, and glass, you will be sure to find the perfect piece for your home. Or as they say in Slovakian, your “domaci”. Dragonfly Art Gallery– 116 E. Main St. Harrisville, MI Dragonfly Art Gallery in Harrisville is a nonprofit, cooperative Fine Art gallery dedicated to displaying member artists’ work for the enjoyment of residents and visitors to the Harrisville area. Many artistic media are represented, including oils, pastels, watercolors, acrylics, pen and ink, photography, jewelry, and pottery. All works in the Gallery are created by Northeastern Michigan artists, several of whom have received regional and national recognition. Inspiration Alcona– P.O. Box 98, Harrisville, MI Inspiration Alcona brings those wishing to be creative together with experienced artists for retreats and workshops in a rejuvenating natural setting. 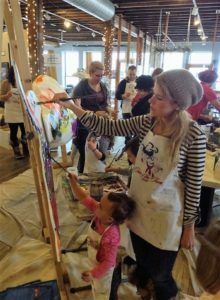 From 1-day to multi-week offerings in everything from painting and jewelry making to writing and dancing, this collaborative effort to inspire through art experiences will leave you with fresh new ideas for your favorite artistic medium. Art on the Bay– Bay View Park at Prentiss St. and State St., Alpena, MI This annual event, held every year in July during the first weekend of the Brown Trout Festival, brings in vendors from all over the state with arts and crafts ranging the spectrum from paintings to furniture. Two days of open air arts and crafts in Alpena’s beautiful Bay View Park is the perfect start to an adventurous summer day in Alpena, MI. See our calendar of events for specific dates and times at www.visitalpena.com/events. Harrisville Harmony Weekend- Courthouse grounds on the corner of US-23 and M-72, Harrisville, MI Labor Day weekend brings 2 full days of arts and crafts with over 300 vendors on site during this annual event. Only a 30-minute drive from Alpena, Harrisville Harmony Weekend offers ample Michigan-made masterpieces that you will not find anywhere else. Harmony Weekend is organized by the Harrisville Arts Council and funds raised are disbursed to the community for adult art classes, scholarships, “Close-Up”, local schools’ choir and band programs, local schools’ art departments, summer concerts, among other community causes and organizations.